Jan. 26, 2011 8:00 a.m.
Drayton Valley RCMP are investigating a robbery which occurred at the Drayton Valley Value Drug Mart in Drayton Valley Alberta Wednesday evening January 26,2011. Police were called shortly after 8:45 pm with a report that a male suspect had entered the Drug Store situated at 5203-50th Street Drayton Valley Alberta wearing a dark coloured “hoodie”, light coloured pants possibly sweat pants and a white painters mask and white rubber/surgical gloves. The suspect presented a note to the on duty pharmacist demanding drugs and left a short time later with an amount of Oxycontin. Oxycontin is a powerful narcotic. 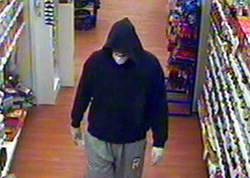 The suspect is described as a Caucasian male, approximately 6′ to 6’2" in height and heavy set. The male fled the store on foot using the rear emergency exit which enters the alleyway behind 50th street in Drayton Valley. No weapons were used during the robbery and no physical injuries were suffered by the 47 year old male victim. Drayton Valley RCMP are asking for public assistance in attempting to identify and locate the person involved in this robbery. Specifically the police are looking to speak with anyone who saw the subject enter the Value Drug Mart in Drayton Valley or observed him in the alleyway behind the Value Drug Mart. Anyone with any information is asked to contact the Drayton Valley RCMP at 780-542-4456. The amount of drugs taken is not being released by the police at this time. The name and specific street address of the Value Drug Mart is being released through the media with the consent of the owners of the Value Drug Mart.